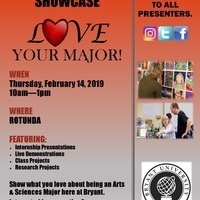 Arts & Sciences Showcase - Love Your Major! Show what you love about being an Arts & Sciences Major here at Bryant. Featured presentations will include Live Demonstrations, Class and Research Projects and Internship Presentations. Interested in participating? Email cas@bryant.edu for more info.